Four ECDSA P256 CSPs are available in Windows. Which one should I use? Since my goal is to use ECC with Perfect Forward Secrecy, I think these are my best options. My choice to use the P256 cert will allow developers to use CBC in addition to GCM. I could choose a higher bit length, but the more secure ECDSA CSPs don't support CBC. Is it wise of me to support CBC? In case it matters, my target clients are mobile apps, browsers, and IoT devices. If I do have a choice, which of the curves are least error prone in 3rd party implementations? One is used for the ECDHE part: a Diffie-Hellman key exchanged is used between client and server, over a given curve. The other is for the ECDSA signature computed by the server: the server signs its ServerKeyExchange message. ECDSA is a signature algorithm that uses computations on an elliptic curve. There is no requirement that both curves be the same; they are mostly unrelated and live in different worlds. On a conceptual level, the one used for ECDHE is more important, because it must ensure security for the lifetime of the data which will be exchanged over the wire (i.e. if the data is still important ten years from now, then the curve must still be robust ten years from now); the one used in the signature is only for now, and it does not really matter if it gets broken tomorrow. Note that forward secrecy is all about the key exchange, i.e. the ECDHE part. This is the same idea: security of the signature system matters only for now. Thus, you could perfectly have ECC-powered forward secrecy with a TLS_ECDHE_RSA_* cipher suite, i.e. with an RSA key in the certificate. 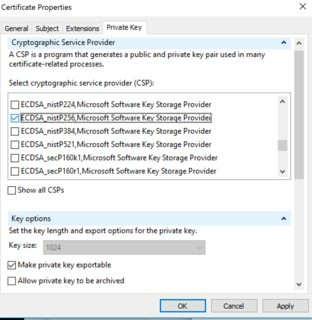 Normally, the CSP choice (technically, "CNG key storage provider") is about the type of the private key that will indeed be stored, i.e. corresponding to the certificate and the ECDSA (or RSA) signature. The curve for ECDHE is chosen independently(*), between the client and server, with secrets which are kept in RAM only (and therefore never stored, which is the point of forward secrecy). That being said, the one curve that is supported everywhere is NIST's curve P-256, also known as "secp256r1" or "prime256r1" (not to be confused with "secp256k1", which is a distinct curve). The NIST curve P-384 also has a fair share of widespread support, although maybe not as much as P-256. Also, P-384 implies a bit more computational work (about three times as much), which does not matter in practice except if some constrained embedded systems are involved (not smartphones; really small systems). An additional point is that P-256 already ensures more than adequate security, even with regards to technological improvements: as far as we know it, if a P-256 ECDHE key exchange ever gets broken, then it will be through use of an as yet mythical quantum computer, and if such a beast is ever built, then it will mince through P-384 with almost as much ease. In that sense, there is no security advantage of using P-384 instead of P-256. Summary: for maximum interoperability, use P-256. Client and server SSL implementations may still decide to use another curve for the ECDHE part; unless specific guidance is applied, that other curve will usually be P-256 as well, or (depending on involved implementations) Curve25519, which is also a nice choice for security. (*) Mostly. Some OpenSSL versions will try to match the ECDHE curve size with the curve used in ECDSA, which may or may not make sense since they relate to different operations with different security characteristics, especially with regards to future technological improvements. P224 P256, P384, -> (unsafe) P521? -> probably unsafe but not listed above. ECC curve order "curve25519" ONLY [to prevent 0day downplay attacks], or "curve25519" ALWAYS over "NIST" for compatibility only. Copy and paste into group policy "Ecc Curve Order"
With this config, No P curve ciphers necessary P=Nist; ECDHE/ECDSA=ECC! Let ECC curve order group policy determine "curve25519"
Not the answer you're looking for? Browse other questions tagged encryption tls certificates ecc or ask your own question. Which elliptic curve should I use? Are the elliptical curves in ECDHE and ECDSA the same? 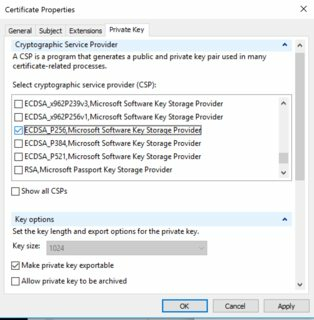 Key wrapping vs RSA encryption? Why are NIST binary curves not as popular as NIST prime curves for ECDSA?